I heard some wonderful news. My friend’s beautiful daughter, who I have known since she was a couple of day’s old – I can still so clearly picture her dear little face, a swaddling bundle in her mother’s arms – is starting at Cambridge this week. Reading English, thank you very much. I’m as proud and happy as I could be if she were my own daughter. Jane had read my post on here about Peggy doing that and thought it might make me smile. It most certainly did. Better still, it’s full of really sound wisdom why I shouldn’t give in to my tweenager’s demands. And I reckon Jane’s kids give her approach to child rearing more than a little credence. And completing the circle, I met Jane at St Andrews where we went to university. It makes me so happy when I hear of young ones starting out on that adventure, because that’s where you make your friends for life. Jane still makes me cry with laughter. We share so many memories we speak in a code of mutual references. It means a lot that we know each other’s parents and as well each other’s children. That’s Jane top left in the picture. I’m on the right with our friend Josephine Fairley (who lives three streets from me now) in the middle. If I remember correctly we were on our way to Raffaella Barker and Hugh St Clair’s wedding some time in the late 1980s. 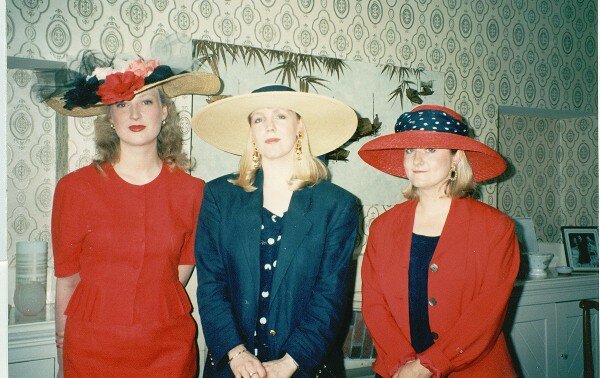 It was a coincidence that we were wearing co-ordinating outfits… Look at Jane’s wonderful hat. I am really enjoying this series! Feeling quite inspired to start noting my own daily positives, even if only to myself. There is not enough good news on the internet these days, thank you! LOVE this! I have a wonderful photo of you in that hat at the wedding on my bookshelves. And I also wanted to say Well Done, Clara! And to Jane for being such an amazing mom. And there’s that wonderful picture of you from the same occasion! \I love that pic of you. Do you have it on your computer? I’d love to post it xxxxx I ran into Raffaela at Port Eliot back in the summer, it was lovely to see her. I am loving your positive posts, there is too much bad news in the world so positivity is welcomed. And like Zoe above I have started listing my positives, just to myself but I think it lightens the load. I clicked through to the article (God I love the internet) and thank you for the link, insightful writing. Very early on we told our children we would never be the cool parents, and we’re not. Our son is now almost 19 and he now gets it, Miss16 accepts it but sulks, however I am sure she will get it in a couple of years too. You and your tween will get there!